OK, I'm running into an issue I can't quite seem to figure out, it may just be that I'm stuck on the way I used to do it in QC with the Multiplexer node where I could pick as many inputs as I needed. Here's the situation, I have 16 buttons on a touch screen, the plan is for each button to trigger an image (composite image) or video to display on another screen. In QC I would have just made each button trigger the corresponding Source Index value of a 16 channel multiplexer and just send the output to the proper billboard. However in Vuo I'm finding myself a little bit limited as I can only choose various 2 or 8 channel Select Input nodes not a 16 channel Select Input node like I need. Originally I was thinking of using two 8 channel Select Input nodes (2x8ch = 16 channels) but because of the way the node rounds lower than value 1 numbers to 1 and higher than value 8 numbers to 8 instead of just ignoring input I can't seem to figure out how to do it without also triggering a value on the wrong 8 channel Select Input node... please help. 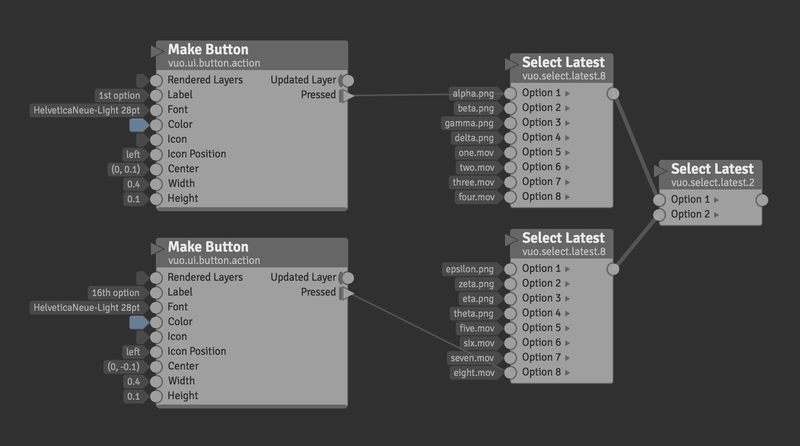 It would be perfect if these nodes allowed you to choose how many inputs you wanted instead of only being 2 or 8 inputs. Ah ok never even understood that FR was about that because somehow I had misread it and thought it was OSC only related. Perhaps it could be something like "Allow more inputs (user defined) for the 2 or 8 inputs nodes (Select Nodes, OSC ...)"
Perhaps somehow related to that is also your FR Add drawers to output ports. Guess if we want user defined output numbers for select nodes, drawers have to be enabled for outputs. 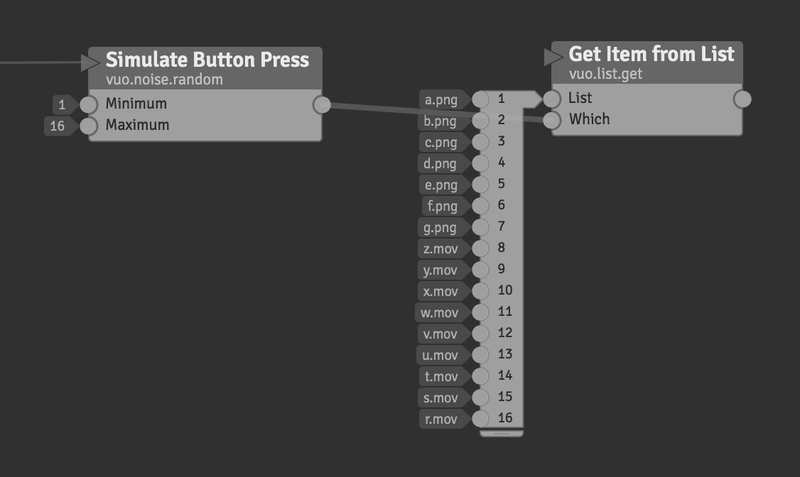 I ended up using the 8-input Select Latest 2-input Select Latest nodes as well... but came up with a ridiculously convoluted way of using a bazillion more nodes to get the exact same result... your way is SO much more elegant! I thank-you for pointing out how much I was overthinking this... I keep forgetting you can hold down Option and strip out data to just leave it an event and use it to trigger just about anything. Turns out I ended up having to go a different route after all. The Select Latest node was working great for my test still images but as soon as I got into video sources it was no longer suitable for selecting my sources (since video is a steady stream of images it's always being chosen as the Latest source). However I ended up using the 8 input Select Latest to output the number of the source on my Select Input node and used combination of compare numbers, math node and a True/False node to split the output to the proper Select Input node. Seems to be working well now. I was even able to make a "Take" button along with a "Dissolve" and "Cut" button to select what transition type I wanted between the current video source and the one coming in. Super smooth transitions and live video even at 3360x1080 resolution output!!! Amazing!